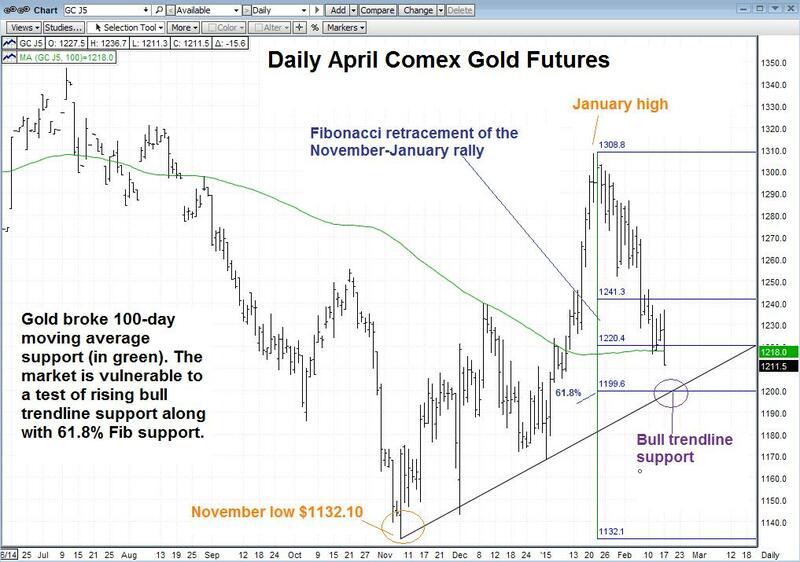 (Kitco News) - Comex April gold futures plunged lower Tuesday, breaking below key support at the 100-day moving average. Gold futures have been correcting lower since the January peak at $1,308.80 per ounce, but now the market is heading toward a test of a critical chart support zone area. Figure 1 below shows a daily chart of April gold futures, with a rising bullish trendline drawn off the November low at $1,132.10 per ounce. That multi-month trendline offers support around the $1,197.70 zone for April gold. The bull trendline support nearly coincides with key 61.8% Fibonacci retracement support drawn off the November-January rally move, which comes in at $1,199.60. The confluence of those two technical support zones creates an added significance at the $1,197-$1,196 area. In the very short-term, the breakdown below the 100-day moving average at $1,218 is a bearish signal, leaving the $1,197-1,196 zone as the next target of importance. If a test of the $1,197-1,196 zone is seen this week it will be a critical "line in the sand" for the gold market. If sustained declines were seen below the $1,197-$1,196 area it would suggest the rising trend pattern off the November low was breaking down, and that recent declines have not been corrective in nature. Generally, traditional Fibonacci retracement analysis teaches that a breakdown under the 61.8% retracement line leaves a market vulnerable to a 100% retracement of that prior move, which in this case would mean a potential retest of the November low. Bottom line? The yellow metal is vulnerable to a test of a critical support zone that could determine the direction for the market in the weeks ahead. A strong downside breakout below the rising bull trendline and the 61.8% Fibonacci retracement area would be a clear bearish chart signal. Conversely, if that zone is tested but holds firm, the bulls would likely become reenergized and refocus on the upside.